This is one Valentine’s Day Sale that I plan on taking advantage of. 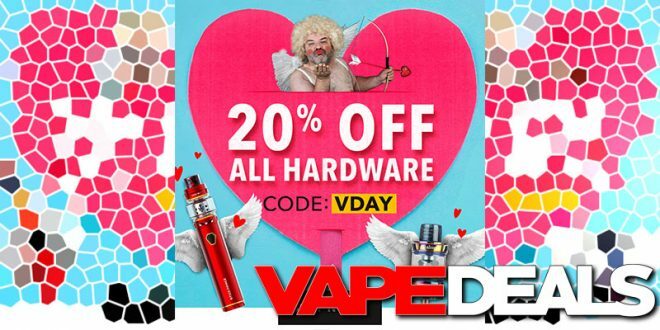 Breazy just released a new coupon code (“VDAY”) that you can use to get an additional 20% off your entire hardware purchase! These guys have had some amazing hardware deals lately, so that extra discount could make for some absolute bargains. A few examples: $20 Lost Vape Orion Quest, $15 Sigelei Vcigo Moon Box, $9 Smok SLM Kit, $16 Joyetech EKEE Mod, $20 Smok V-Fin 160W Kit, $24 Sense VJet 230W Kit, etc. That’s barely even scratching the surface, so stop by and have a look for yourself. They have a handful of e-liquid deals available as well (no coupon code needed for those). Just keep in mind that these offers expire Sunday (2/17) at 11:59pm EST. Shipping is FREE when you spend $50 or more.